Phairs/Fairs, Patent Rolls Cromwell 1655-1659, Lord Protectors Letters on behalf of Colonel Phaire, died Whitehall, Skibbereen, West Cork, 14th August 1657, from Thrift’s Abstracts. Later generations of the family were in the Dunmanway area and may have been active early 18th century buying land from the Hollow Blade Company of London (victims of South Sea Bubble). The family were active in Cork City ‘Phairs Cross’ on the Southside. 1.) 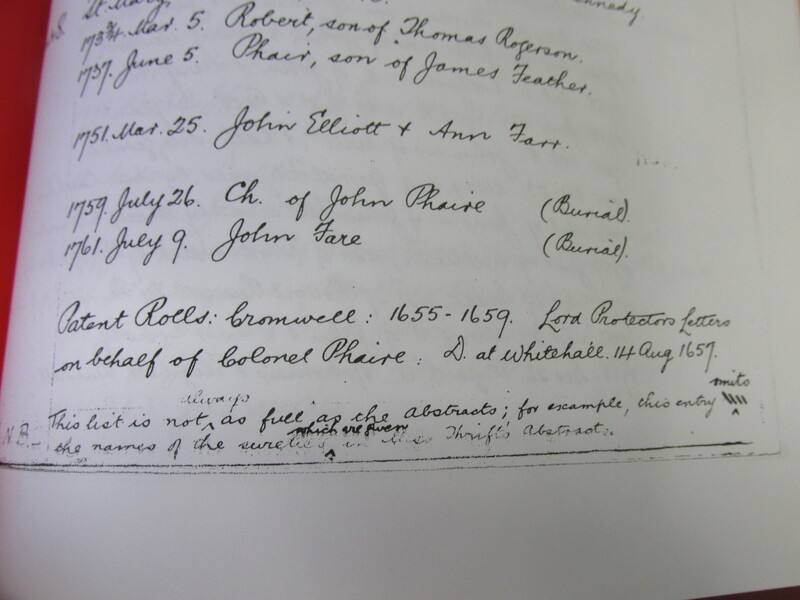 Oliver Cromwell died at Whitehall in London 3 Sept 1658 and Colonel Robert PHAIRE died in Sept 1682, so I have no idea what death is being referred to in the page by Gertrude Thrift. 2.) There is no proof to support that the below John FARE/PHAIRE the Tyler/Slater was a descendant of Colonel Robert PHAIRE. 3.) It is true, that Rev’d Dr. John Patrickson of Dunmanway co Cork did marry as his 2nd wife Elizabeth PHAIRE who was a daughter of Colonel Robert PHAIRE. 6.) According to all known records, John Fair / Phair / Phaire the Tyler and/or Slater did not dwell at anytime in West co. Cork.